The Galaxy Tab 3 Lite will be the first to launch sometime in week two in Cream White color with a 7-inch screen; it will be followed by the Galaxy Tab Pro 8.4 and Galaxy Note Pro 12.2 sometime in week six, while the Galaxy Tab Pro 10.1 will arrive just a week later. All three Pro tablets will be available in black and white colors; the Tab Pro 8.4 and 10.1 will come with 16GB of storage while the Galaxy Note Pro 12.2 will have 32GB storage out of the box. As always, the launch time frames may vary a bit, though all four will be out before March is over. We already have some details on the specs of the Galaxy Tab 3 Lite and the Galaxy Note 12.2 Pro, and we’ll be keeping an eye out for info that might crop up about the Galaxy Tab Pro 8.4 and 10.1. 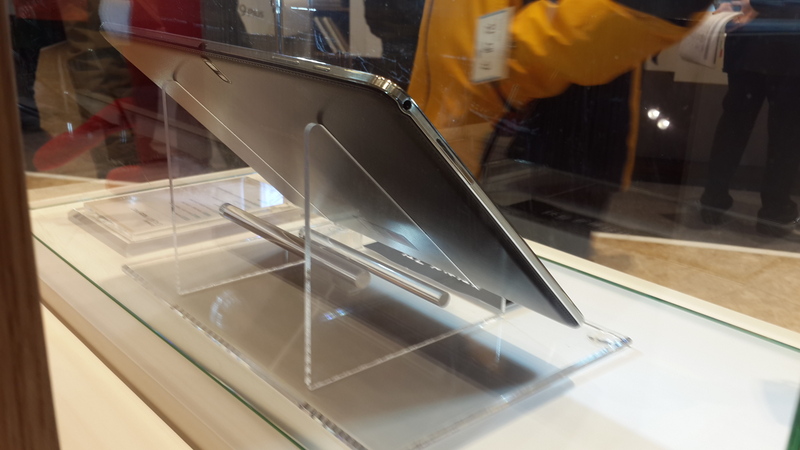 Update: Here’s a live picture of the back of the Note Pro, courtesy of cdpkorea.com. so maybe Finally an 8″ tablet in actual HD (720p is not hd!) with decent screen and MicroSD slot? There is literally no tablet with 1080 and microsd below 10″..
10.1″ is amazing for media though. I enjoy watching movies even on my outdated Galaxy Tab 10.1. Maybe we’ll see this trend continue with other devices such as the S5?